Is it possible to have a career centred around your passions? Is it possible to build a profitable brand whilst in full time employment? Is entrepreneurship the key to closing the gender pay gap? We'll be talking about how we can find meaning and self fufilment at work, and how we can live our values while making a living! 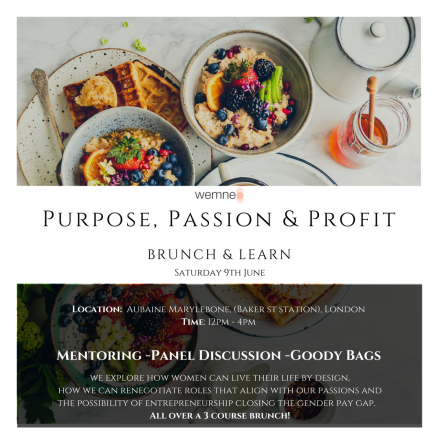 This event is aimed at women who want to be enlightened, encouraged and empowered to take charge of their careers, side hustles and overall progression. Three Course brunch at beautiful Aubaine, which combines classic French cuisine with rustic, continental style. Career and/or business mentorship from one of our selected female speakers who will be joining you for a meal alongside like-minded peers. Panel Discussion with accomplished speakers sharing their insights, career and business journey, in addition to practical tips around gender pay gap, female leadership, confidence and knowing your value. Goody bag worth over £50 (p.s. make sure you're following us on social media for the big reveal) and automatic entry into our #WEMNEturnsONE anniversary giveaway. A free copy of WEMNE's 'Negotiate Your Role' workbook, which includes a quick guide to negotiating a salary increase. Ronke Lawal is the founder of 'Ariatu PR'. In January 2010, Ronke became the Chief Executive of the Islington Chamber of Commerce until the end of 2012, and has since held a number of non-executive roles. In 2018 she became a director on the board of directors at the Chartered Institute of Public Relations. She is a mentor for the Cherie Blair Foundation and in 2011 was honoured to receive a Precious Award for Inspirational Leadership. Mairi McHaffie is an Impact Expert and CEO of 'Scene Change Creative Consultants' providers of bespoke development and talent initiatives. She is Director of Coaching Squared, an award-nominated cross organisational leadership development programme and the founder of the House of Commons Women into Leadership (WIL) programme. She is the Coca-Cola European partners storytelling expert and senior trainer for KPMG Civil Service, in addition to being a judge on the BBC Apprentice Final (as part of a team of business experts). Albertha Charles is a partner in PwC's Deals business and the UK leader for the financial Services Valuation Business. Albertha champions diversity and inclusion and is a member of PwC's Talent and Diversity Council, working with PwC Executive Board members and people leaders across the business. Albertha is a CFA Charter holder, a qualified accountant and holds an MBA from Manchester Business School. Albertha was voted 2017 Financial Service Leader of the year by BBBA and was recognised in the FT EMpowerTop 100 ethnic minority leaders list for 2017. Harriet Minter is a journalist and broadcaster, specialising in female leadership. She founded and edited the Guardian's Women in Leadership section, which focused on women in the workplace and now writes for them on Women in Tech. She is also a columnist for Psychologies magazine and hosts The Badass Women's Hour on TalkRadio. She's written for publications including The Times, Huffington Post and The Pool. She is a regular speaker on women's rights, the future of work, and digital media. In the past two years, she's given two TED talks the first on the importance of learning to fail and the second on yoga, which has had 10s of thousands of views. Outside of work her passions include high heels and big boats - just not together. Jessica Huie MBE is an entrepreneur and the Author of PURPOSE, Find your truth and embrace your calling published by Hay House. Twelve years ago the founder of JHPR launched Color Blind Cards, a multi-award winning multicultural greeting card company which drove an early conversation around the importance of ethnic representation in retail and became the first independent brand to secure a high-street presence for black cards. Labelled one of Britain's Most Inspiring Entrepreneurs by the Evening Standard. Jessica sits on Glamour's Power List as one of the UK's most influential women. In 2014 Jessica was honoured with an MBE for entrepreneurship and her contribution to diversity.